As we are in Spain and I like dogs and miss my own very much, I thought I'd give my monthly donation for December to an organization called SOS Animals, they have organizations supporting homeless dogs in Spain both in Sweden and in UK. I picked this organization as my friend has volunteered for them in Malaga so if she says they are good I trust her. Most importantly though, remember to take care of the pets you already own or the pets that are in your home country. 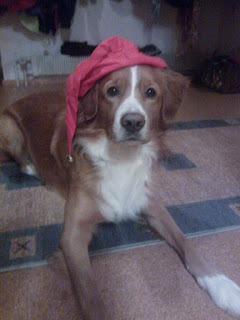 Late Christmas greetings from our dog currently in my parents care. Hello , it is a great blog, thank you guys for good work !